How does a romantic picnic in breath-taking scenery sound? Whether you’re lovestruck or moonstruck or both, the perfect evening in the month of love beckons. 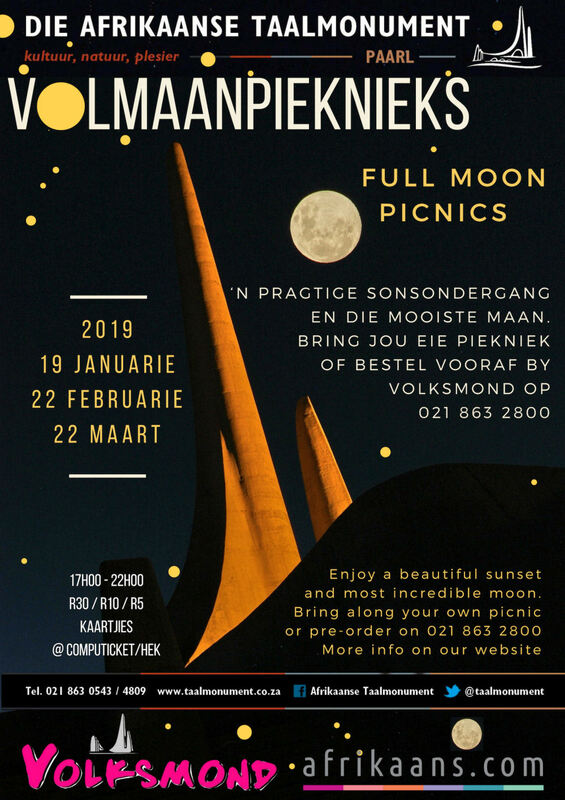 Simple join the Afrikaans language monument’s friendly staff on a beautiful evening on the picturesque Paarl Mountain to celebrate a Full Moon Picnic on Friday, 22 February 2019, in aid of a good cause. The picnics on Paarl Mountain are very popular with locals and overseas visitors, who particularly enjoy the sunsets and incredible night scenes of the valleys, mountains and peninsula. Visitors can picnic between 17:00 and 22:00. A free guided tour that explains the symbolism of the Afrikaans language monument, an exceptional sculpture, is offered at 18:30. Visitors are encouraged to explore, and there are outdoor games and playgrounds for children. Guests are welcome to bring their own picnic baskets or pre-order one (R300 for two people or R400 with a basket included) at the Volksmond Coffee Shop on 021 863 2800. Volksmond will be open for coffee, light refreshments and pizza. Please bring warm clothing and a torch. The evenings are held in aid of ‘Let’s Read!’, the Taalmuseum’s reading project for children, and visitors are encouraged to donate a new or second-hand children’s book. Tickets are R30 per adult, R10 for SA students and R5 for children (free under six years). They are available from Computicket or at the gate; no booking is required. Annual permits are available at the language monument at R120 for individuals or R220 per family, which includes access to all the Full Moon Picnics. For more information about all the other exciting events at the Taalmonument, call 021 863 0543/4809, visit www.taalmonument.co.za or follow them on Facebook. The next and last Full Moon Picnic is on 22 March.